When Rachael from Imagine Gnats asked if I'd like to be part of her Perfect Pattern Parcel #2 Sew Along, I enthusiastically agreed without having seen the patterns. 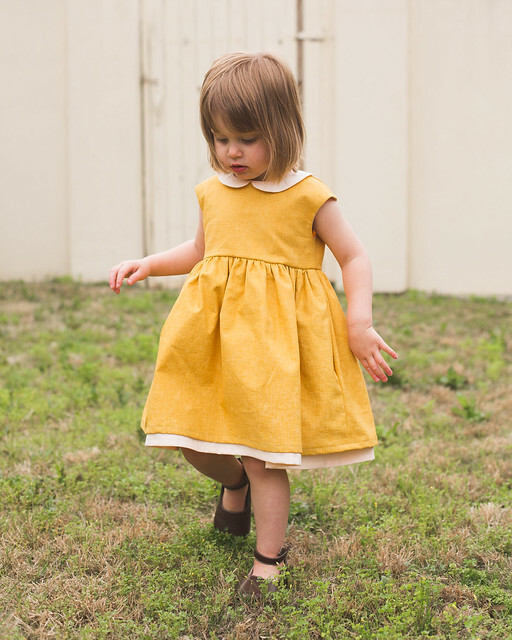 I trusted Rachael's vision and I love to support indie designers - in fact, I buy indie patterns as often as I can. But when I saw the patterns in Parcel #2, not only was I completely thrilled with the options, but even surprised by the level of awesomeness. These patterns are all so, so great. The package exceeded my expectations, which were high. 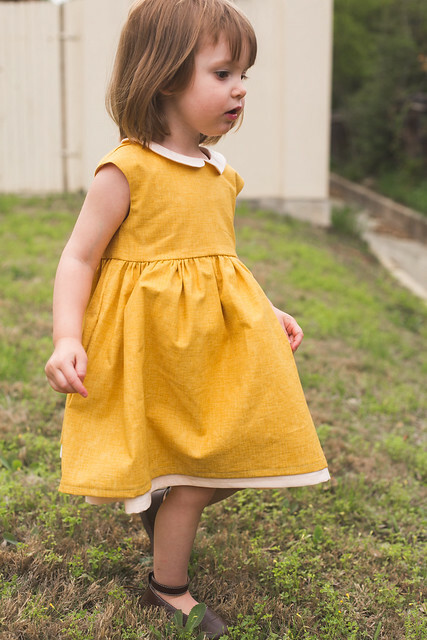 The parcel happens to include one of my most loved patterns, the Hanimi dress, which I've made a whole lot. 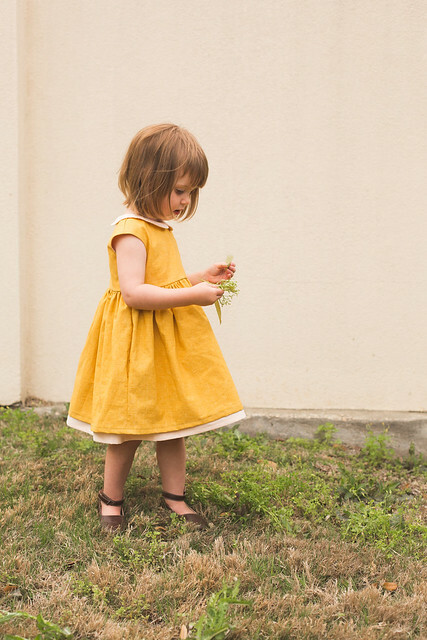 And interestingly, you pick the price of your parcel, which not only supports independent designers but also a portion of the proceeds go toward improving children's educations. So cool, right? The pricing options are great (and unbelievably affordable). You can read all about it here. With Easter in mind, I decided to try the Caroline Party Dress. The pattern reminded me of some of the Geranium-Hanimi hybrids I've made (especially this one), but with a fuller skirt and the option to add an underskirt. I love the Geranium dress and I love the Hanimi, so the option to put them together is pretty fantastic. 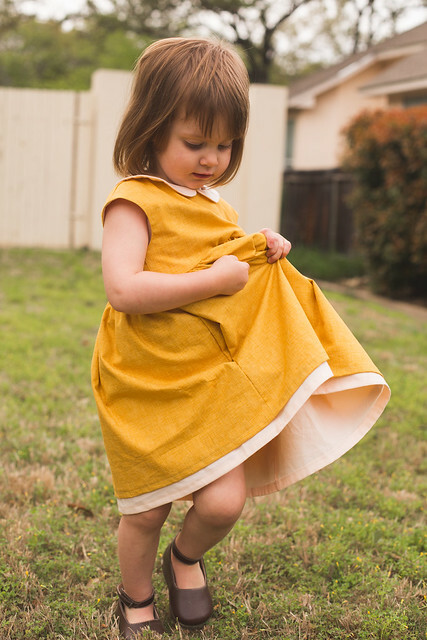 The underskirt and collar give this dress a classic vintage feel, so in keeping with that theme, I went with a yellow faux linen by Kaufman that I had in my stash. The faux-linen-on-quilting-cotton is brilliant, because you get the look of linen without all of the shiftiness of linen. And I love the drape of this material so much. I paired it with a soft light peach solid for the underskirt and collar. I adjusted the length of the underskirt, making it an inch or so longer than the main skirt. It closes with a zipper. I've come to love zip closures. I love this pattern! 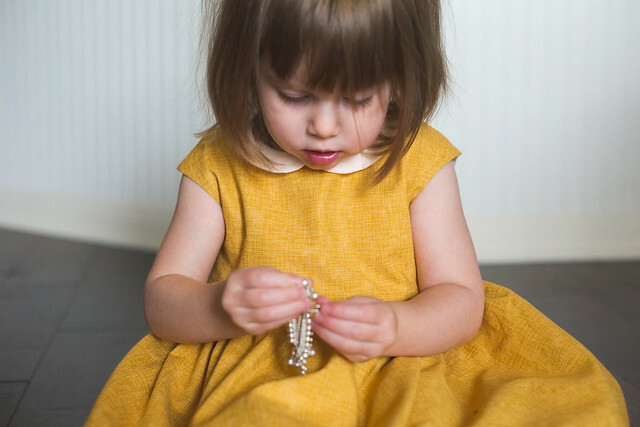 And I could hardly handle the sweetness of Iris in this dress. I just wanted to squeeze her and kiss those chubby cheeks (a favorite hobby of mine anyway). This video demonstrates- via paperdolls - all of the amazing combinations you can create using these parcel patterns. Isn't the video great? It's inspired, right? I love it. The combinations are so good! This pattern parcel is only available for 13 more days, so definitely check it out soon! OOOOOH! Rachel, she is SO sweet :) and of course, the dress too. just perfection. i am completely smitten!!! What an awesome dress! I love the fabrics that you've chosen and the underskirt is nice touch. I keep seeing the shade of yellow all over and I love it! Ack this is perfect! That yellow is stunning.... so simple, so sweet, and so perfect. Thank you so much for letting me know that you blogged about it. I will be sharing this on my facebook page, if you don't mind! So precious and such a lovely color! 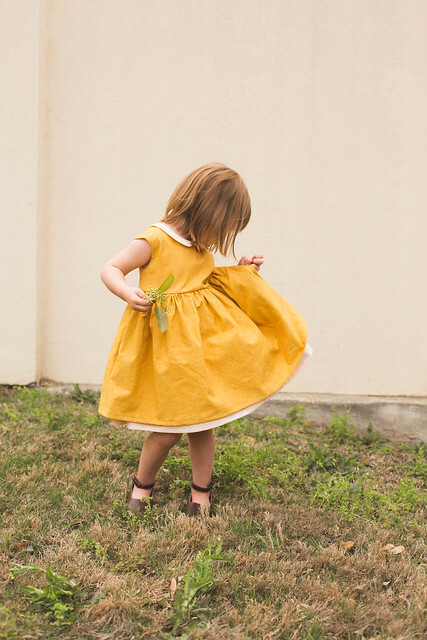 This is such a sweet version of this dress! You've definitely cvonvinced me to make one...although I'm 90% sure that my child will petition for the tulle underlayer! And, oh my goodness, Iris looks so old in these pictures! She's growing up!! I'm so tempted by this pattern package as I've been so impressed by all the versions I've seen over the blogosphere. But, I'm also trying to be SO good with not buying new patterns before using some of the many unused patterns I still have lying around. Such a dilemma, and your gorgeous dress just makes it harder to refrain! Well, Lucinda, I am all for using what you have! I think that's a great philosophy! So no pressure here. :) I also think it's awesome to be able to shop in a way that supports independent designers and charity - and the prices are so right. So I don't think you can go wrong either way! :) Hugs! It is so beautiful and I love the colors you chose - they are still sweet and girly but unexpected. 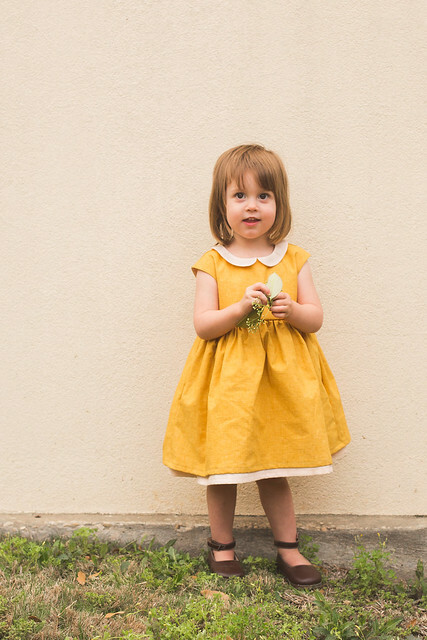 This is so pretty - perfect Easter dress. 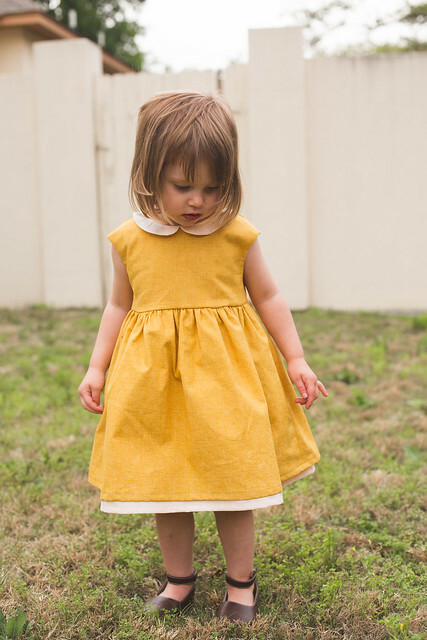 I want to try making a Caroline dress now too! I have made 4 of the PPP garments so far. 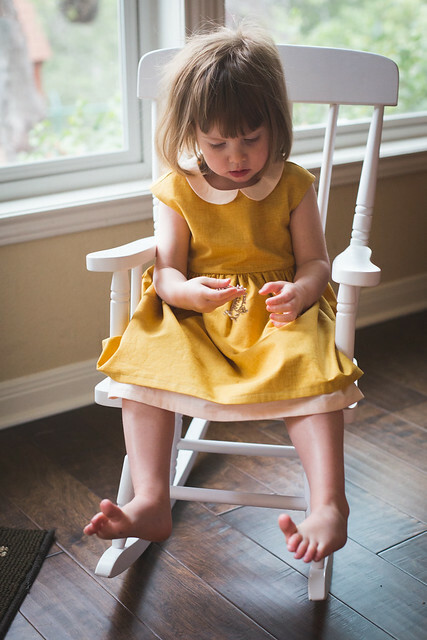 I wasn't going to make the Caroline party dress but now I have seen your version and I've fallen for it. The yellow fabric is the perfect choice I think. I love how it gives it a vintage feel. The versions on the actual pattern were too twee for my liking that's why I wasn't too keen on making one. You have just won me over. The Caroline dress is back on my list. Can I add one of you images to my Pinterest board 'things id like to make one day' please? Love it!!!! As usual, you have a way of taking a pattern I initially think is too "frilly" and making it simple and understated and right up my alley. You have my number, Rachel! It's so cute, I love the "linen look" with quilting cotton maintenance too, haha. Like the flannels that look like wool. Good call letting the underskirt peek out - I bet this dress fits a long time (and then can be passed along to her baby sister!!!). Also love the photoshoot, how it seems like you just followed her around for a couple hours and snapped away. Best kind. I definitely thought that was linen when I looked at it...really pretty! The solid color really shows off the pattern nicely. I may be making one of these next week now too! Great dress! I love the underskirt peeking out and what great fabric! I haven't seen it before but I'll have to check it out. Perfection! 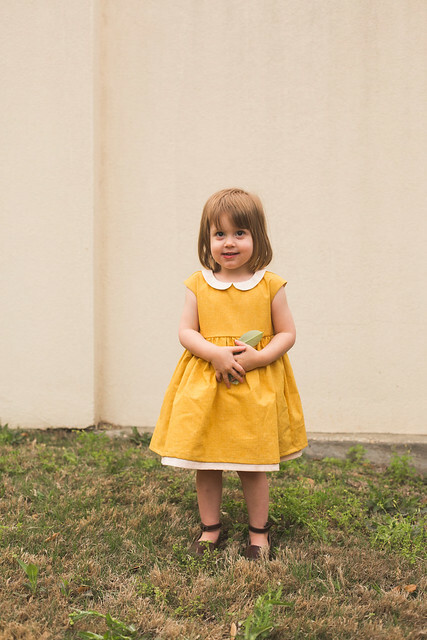 I think that particular shade of yellow is gorgeous on her. Love the full skirt and underskirt! The color of this dress is amazing! I love how simple it is and the vintage feel is spot on. So cute! Such a simple, beautiful dress. The colours you used are such a great fit. I love it. 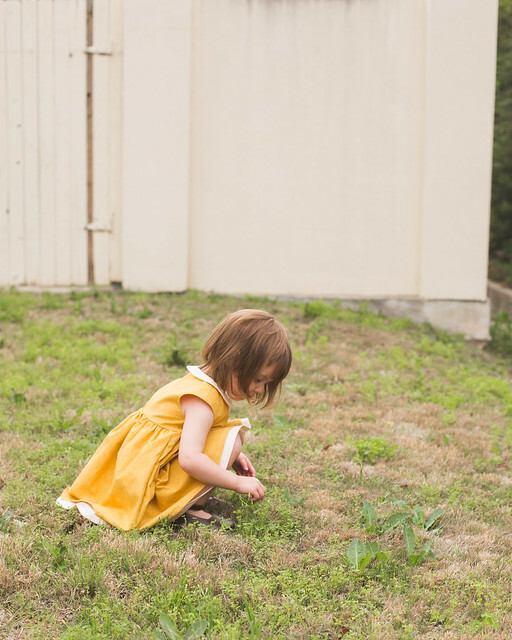 Iris is so delightful in these pictures, and those cheeks! So adorable! I have had this pattern since PPP... I have been meaning to use it since! I just HAVE to make one for my little one!